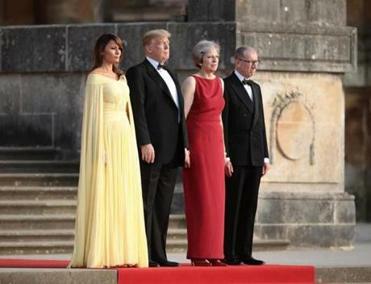 President Trump (second from left) and first lady Melania Trump (left) were welcomed by British Prime Minister Theresa May and her husband, Philip May, to a gala dinner at Blenheim Palace near Oxford. LONDON - After Prime Minister Theresa May rolled out the red carpet at Blenheim Palace on Thursday night for President Donald Trump’s first official visit to Britain, a London tabloid published an explosive interview in which Trump blasted May’s compromise, pro-business plan to leave the European Union and warned that her approach could imperil any future trade deal between the United States and Britain. 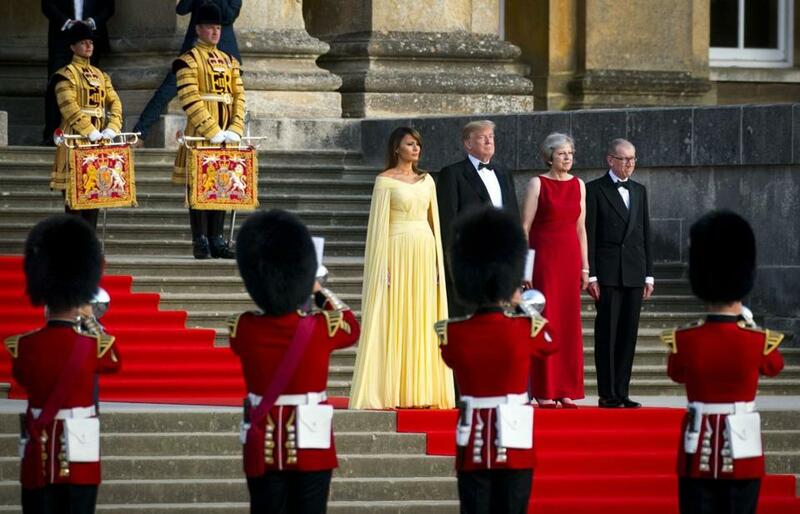 President Trump and first lady Melania Trump were greeted with pomp and circumstance — along with protesters — as they arrived at Blenheim Palace for a gala dinner. If May has Britain align its rules and regulations for goods and agricultural products with Europe, following ‘‘a common rulebook’’ with Brussels, as May puts it, then, Trump said, that could derail a trade deal with Washington. ‘‘If they do a deal like that, we would be dealing with the European Union instead of dealing with the U.K., so it will probably kill the deal,’’ Trump told the Sun, which published its splash at 11 p.m. in Britain. Trump is scheduled to meet with May for talks on Friday. A senior U.S. official verified the comments but said the president also made more positive comments about May that were not included in the article. The interview was earlier in the week. Trump wanted to do the interview, this person said, and others warned against it. The U.S. contingency expected the story to post in the morning and were startled to leave the dinner Thursday and see it online. Sarah Huckabee Sanders, the White House press secretary, told the British government about the interview but thought it would be somewhat more positive, the official said. A senior White House official said Trump had two days of positive interactions with May. But the official also conceded that Trump had talked about her vulnerabilities and criticized her political acumen privately for many months. Trump lashed out at London Mayor Sadiq Khan, too, saying that he’s done a ‘‘bad job’’ on tackling terrorism and crime. But he spoke glowingly of Johnson, who quit the cabinet earlier this week in protest over May’s plans for a soft Brexit. Trump did not have any public events in Britain on Thursday. Planners have taken great care to keep him from protests. After his trips overseas to Asia and the Middle East, Trump went on for days about the grandiose treatment - and the Brits were clearly trying to do well by him. Then moved to the deals she hoped to strike. ‘‘Now, as we prepare to leave the European Union, we have an unprecedented opportunity to do more. It’s an opportunity to reach a free trade agreement that creates jobs and growth here in the UK and right across the United States,’’ she said. The prime minister said that Brexit offered the chance ‘‘to tear down the bureaucratic barriers that frustrate business leaders on both sides of the Atlantic,’’ according to an account provided by 10 Downing Street. An hour later the interview with Sun appeared and seem to dash May’s hopes. Brian Klaas, a fellow in global politics at the London School of Economics, said May is walking a tightrope. She needs Trump to promise fantastic trade deals and help May deliver the ‘‘global Britain’’ she has promised. But she can’t appear fawning. Organizers say that from the moment Trump lands on British soil to the moment he leaves, he will be met by a ‘‘carnival of resistance.’’ A giant ‘‘Trump Baby’’ balloon will fly over Parliament Square. Protesters plan to shout at Trump at places he will be visiting - Winfield House, Blenheim Palace, Chequers, Windsor Castle and his Trump Turnberry golf resort in Scotland. Others will assemble in towns and cities up and down the country. ‘‘I’m marching because of the disdain that Trump has shown for Britain and because of his disgraceful treatment of minorities in the United States,’’ said David Lammy, a leading member in the opposition Labour Party. ‘‘Whenever London experiences a tragedy, it’s also the case that Trump licks his lips and tweets,’’ he said.